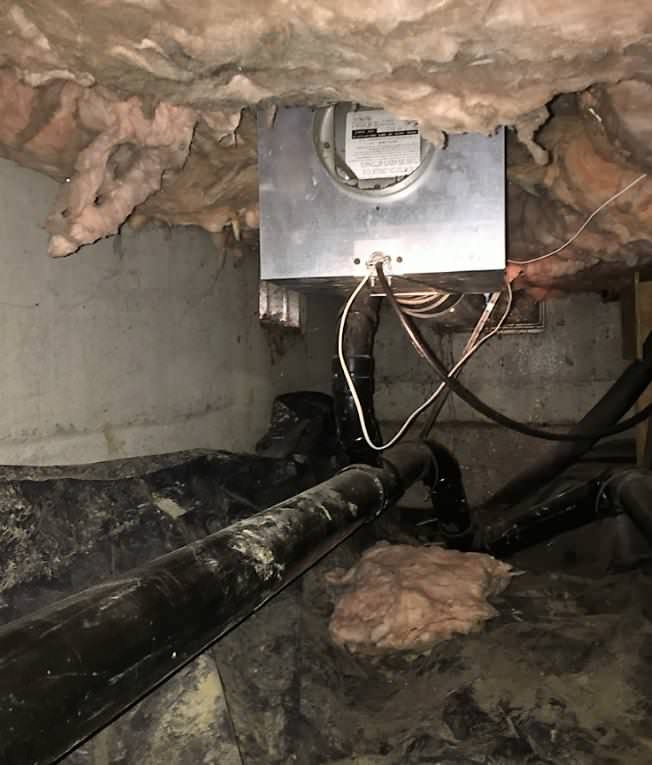 Recently purchased a new house and during the inspection the inspector found some kind of ventilation fan in the crawl space under the bathroom that appeared to have no use. It doesn't seem to be connected to the HVAC system or anything else and the duct-work going to the outside is cemented over. I've translated some of the text and it seems like its supposed to be a bathroom ceiling fan. I've noticed that it is generating a small amount of heat that can be felt through the floor. Anyone know what this might be for or if its should be shut off? There is a circuit breaker in the garage labeled blower that I suspect is for the outlet this is plugged into. What's even more interesting is the extra white wire that's going into the fan unit next to the black power supply wire. That makes me think it's controlled in some way by, say, a humidistat or thermostat. Is there an unexplained device on the wall somewhere. 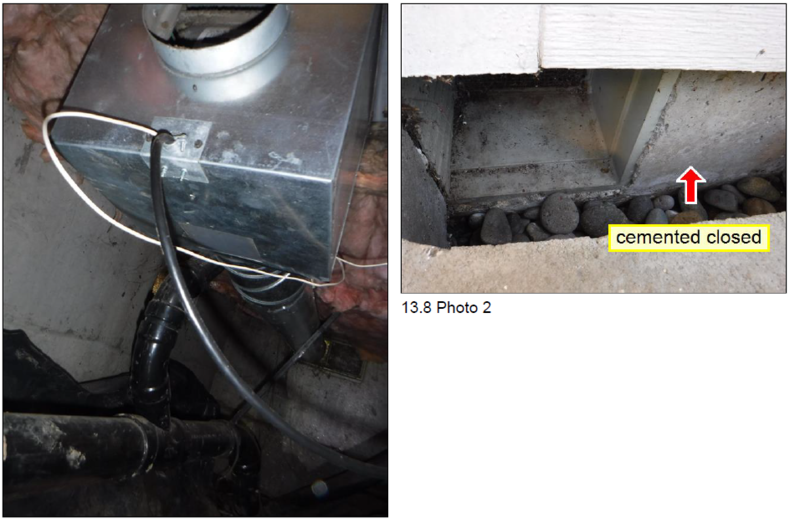 I'm assuming the picture at the top left is shot looking downward towards the crawlspace. If so, the duct going into the floor doesn't seem to make a lot of sense. Could this be a poor crafted ventilation fan for radon? Is radon a problem in your area? Sometimes home owners do all kinds of weird things that can defy logic and building codes. I would just disconnect the wires and maybe even remove the unit. The duct work can be taken down to the floor level and the hole filled with some expanding foam and capped. As you mentioned in my other post the white wire does seem to be connected to the indicator light. Top left picture is a little crooked but the dirt is at the bottom and flooring at the top. Maybe the picture below will help. Radon or a fan to dry out the crawl space were my original thoughts too, as far as I know radon isn't a problem. 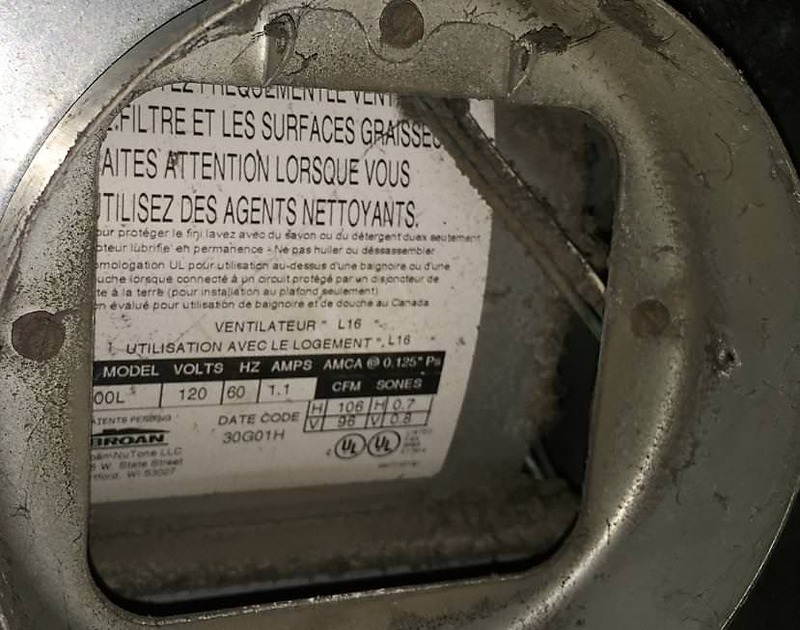 Got a better look at the model number (L100L) and it is supposed to be a bathroom fan. Based on installation instructions its upside down from how you would mount it in the ceiling. Its sucking the bottom of the floor then blowing to the cemented closed vent. Is it possible at one time the bathroom fan was in the floor instead of the ceiling? I would disconnect the wiring from the breaker so it can't be turned on accidentally. That would also free up a space in the panel should you need it for something else.